As we’ve been speculating for a while it will be a clash of the titans at Sonisphere UK next summer. The 40th year of festivals at Knebworth celebration will be topped by heavy metal giants Iron Maiden and Metallica‘s sole UK performances in 2014. And Maiden’s shows in 2014 will be another round of the Maiden England World Tour, with a promise of tweaks to the setlist. 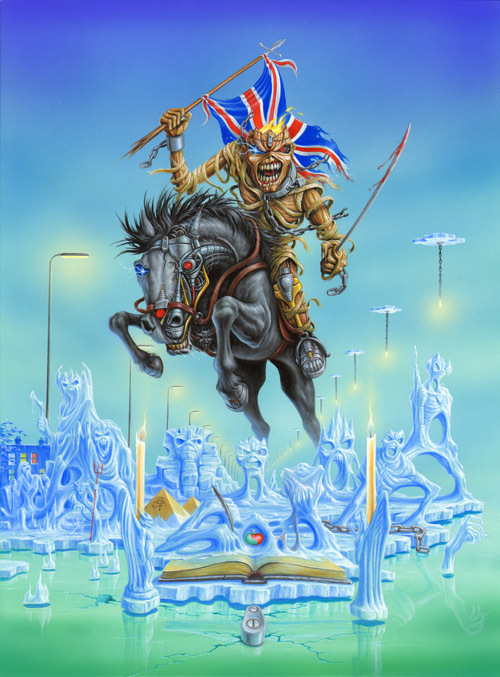 IRON MAIDEN will return to Europe in Summer 2014 starting in late May with a short run of major festivals and a few select arena shows to round off their Maiden England World Tour which ends with a headline performance at the UK Sonisphere Festival in July as part of the 40th Anniversary celebrations at Knebworth Park. By the end of the tour the band will have played 102 shows in 32 countries to well over two million fans since starting in the USA in June 2012. For details on tickets and to read the full Sonisphere press release, click here. As all our fans know, Maiden England is Part 3 in the History Trilogy of the 1980s video/DVD releases so this is likely to be the last time we will tour with a set list based on the ‘80s, and therefore the last time fans will EVER hear some of these songs played live. With this in mind, for the 2014 dates we plan to change the set list around a little, to make it more equally representative of the whole of the ‘80s period covered by those three DVDs – Early Days, Live After Death and of course Maiden England, along with one notable exception from the 90s, the fans will know which song I’m talking about! Heavy Metal heroes James Hetfield and Bruce Dickinson team up for Knebworth celebration. ← ON TOUR 2014: Hellfest leak – more Maiden England in 2014? So they made the history dvds conviniently enough a trilogy excluding live at donington 92 fear of the dark will be played again and other 80s albums will get more “spotlight” in this one.. So let’s hear it for Run to the Hills Number of the beast 2 minutes wrathchild once more.. .YAYYYYY …. no not from me… once again boring and meh news from my fav band…. So, what was the Be Quick or Be Dead tagline all about?! This sounds like it’s going to be Somewhere Back In Early England tour, with none of the ’90s stuff we’ve been debating for the last few weeks. And what’s the betting there’ll still be no Flight of Icarus and Infinite Dreams?! Still, any Maiden is better than not Maiden… Guess I’m going to Knebworth! I get the Be Quick or Be Dead reference after seeing the whole line-up for Hellfest. It’s going to sell out within minutes. So basically the majority of fans in the UK will have gone 4 years without seeing the band, that’s IF they finally tour here in 2015, just disgraceful. I’m speachless ME is running into its third year. And why not drop FOTD and reintroduce HBTN?? To be fair, UK fans will have gotten at least 4 Maiden England shows on their turf by the end of the tour. Not spread throughout the Kingdom, sure enough, but I think UK fans should bear in mind that there are plenty of countries and continents that will have had ZERO concerts. This is indeed a valid question. How is the 2012-13 set not representative of each of those History DVDs? Rod was really setting the fans up for disappointment by not being clear about the tour plans before. As far as we knew, the Maiden England tour was over, and in simply stating that the band planned on touring next year, he got a lot of people’s hopes up by implying that this would be a new tour. While I understand the intentions behind playing in some cities they hadn’t gotten to yet, it should have been stated from the get-go that the 2014 tour was going to simply be additional Maiden England shows. There was no need to be secretive about it and get so many people excited for no reason. And damn, like Ziggy pointed out, this tour is going into its third year…wow. I am a bit disappointed that for the first time I’ll have to wait more than the usual 2 years to see Iron Maiden again. Personally, I gave a sigh of relief that it wasn’t a completely NEW concept, as in “let’s shed some light on the early 90s!” Now, if they could dig up stuff like Flight Of Icarus and Infinite Dreams and Stranger In A Strange Land to plug some of the History holes, I’d be ready to gush about this. That sounds like a downright drool-worthy show, however my comment actually wasn’t in regards to anything set list related; what I mean is that, in announcing a new tour, Rod got many fans (myself included, here in the States) excited about the possibility of getting to see Iron Maiden again soon. Had Rod clarified from the beginning that the 2014 dates would be additional Maiden England dates, we would not have had that misplaced hope of getting to see the band again next year. I agree with you, IF they decide to pull out some long-forgotten gems as you mention. But if they just go out with more of the same tired, easy choices, then I’ll be sad that they didn’t do a 90s tour again. How about this new poster art? Damn, now it actually looks like Maiden England, doesn’t it? That new art work is pretty amazing. I agree Christer this is MUCH better than a 90’s set. I am however surprised that this is the 3rd year for Maiden England. Icarus won’t happen. Steve has never liked it. Same for Stranger. Too bad both are awesome. Drop Afraid to Shoot Strangers and add Infinite Dreams the set would be perfect. @JR: I’m 99% sure you’re right about Icarus and Stranger not showing up, unfortunately. Never heard that Steve doesn’t like Stranger, though. Bruce has claimed Steve “never liked” Icarus, but Steve refutes that in the same story and has also stated he wouldn’t change a thing about Piece Of Mind, he just preferred the live version of Icarus. Stranger is among the “great” Adrian tracks on Somewhere In Time, according to Steve. So does this thing about Steve “not liking” either come from anyone but a sour Bruce at the time he was out of the band? For whatever it’s worth, Bruce states on Sonisphere UK’s website that this will be Maiden’s last History tour. Which should mean there’s no intention of ever treating the 90s like the they did the 80s. So that speculation can be laid to rest. I think their wasting valuable time with this “tour”…. If it wasn’t for the 90s which I insist that produced great music as well, and would be the fair – logic thing to do, with their history, they should work on a studio album… Let’s face it … No one’s getting younger and based on Rod the band will work on the album after the end of this tour… I’m so dissapointed in what direction the band’s been taking since 2012 that I don’t know if I’d go watch them if they added my country in this tour… I know what they can do live, even though it’s much more restrained nowadays, but watching a best of setlist once again is not what I’m interested in… Seen the SBIT tour seen the Amolad tour (even if it was the second leg) and had the more fun at the 2007 gig… In my opinion Maiden just becoming more of a money grabbing machine where in the near past they tied things up with quality and ballsy decisions..
@SakaRaka7: Personally I think you’re interpreting it as “half empty”. The cycles of new-old-new-old-new-old have been well established since 1999. 2012/13 was always going to be old. I’m just disappointed it wasn’t rarer old. But we can’t really assume that next summer’s short tour takes the place of working on a new album. Without a tour in May-July, they just might have done nothing at all until September and then started a new album. A year off from activity was not unheard of in the past. 1989, 1994, 1997, 2002. They’ve been VERY active in the past few years. A couple of years ago, we didn’t even know if there was EVER going to be another album at all! 2 great 2014 setlist surprises without eliminating the rarer greats in the 2013 set would make me quite happy next summer. And actually going from that short tour right into the studio seems to be a neat compromise between Steve, who wants six months off before starting albums, and Adrian, who would like to go right from the stage to the studio. Several people around here say they would be disappointed in Children Of The Damned. I wouldn’t.